Many of us like to know what temperature will this particular day. But sometimes the apps we've downloaded from the App Store were too simple and have stopped using them. 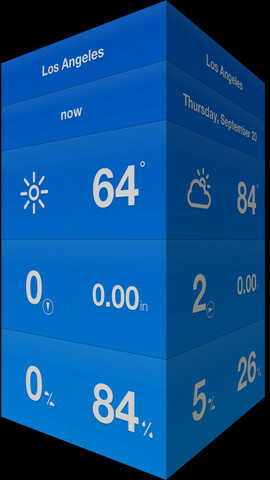 Well, barely two weeks ago V2 Digital Media published this original weather application in cube form. Clear, simple and interactive. Weathercube is an application that shows the time controlled by gestures. No buttons: we just slide the bucket to get the information. It offers a detailed view by hour, day and week, and more than 1.7 million by choosing cities. In addition, we can customize the application with different color themes and is available in multiple languages ​​(including Spanish). And best yet: is a free universal app for now. Do you urge one to try?